WHAT IS TREIBBALL? Treibball is an exciting new dog sport that began in Germany a few years ago. The goal is for the person and the dog to work as a team. The handler directs the dog from a distance around a set of balls to push them into a goal one by one. In competition the dog's work is timed. Distance, time, and the number of balls are some of the variables in the game. NATE is a 501(c) 3 organization committed to promoting and educating the public about the sport of Treibball. 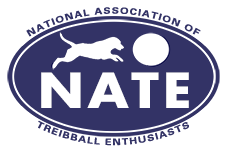 NATE Treibball is a fun, safe and challenging sport where dogs and handlers at all levels can participate. We endorse only dog friendly training techniques that support the best qualities of the human/canine relationship.